It is quite possibly the most ridiculous ice cream inspired by an equally ridiculous pastry. Here we have a surprisingly elegant but decadent ice cream, inspired by a gluttonous fritter that in turn is a pop food culture to Elvis Presley and his legendary love of (fried) peanut butter and banana sandwiches. What?? Such a complicated means to an end – but one that’s worth exploring. A rich peanut butter and banana custard base, with a hint of brown sugar, vanilla, and cinnamon. Bittersweet, homemade sea salt ganache and cinnamon roll pieces swirl throughout this rich indulgence. It seems so complex, yet it isn’t terribly difficult to execute. You’ll never make boring ice cream again! You might be baffled why on earth someone would create an ice cream based on a doughnut (more specifically, a fritter), much less such a bizarrely constructed pastry in the first place. If you have ever visited or heard about Voodoo Doughnut, then you have an idea what I’m talking about. Portland, Oregon’s Voodoo Doughnut has captivated foodies, pop culture devotees, and tourists alike with its uber kitschy, sharp-humored and decadent creations. Check out my related blog post to learn more about this food and cultural phenomenon. During my visit to Voodoo Doughnuts, it was a friend’s selection of pastry that inspired me. 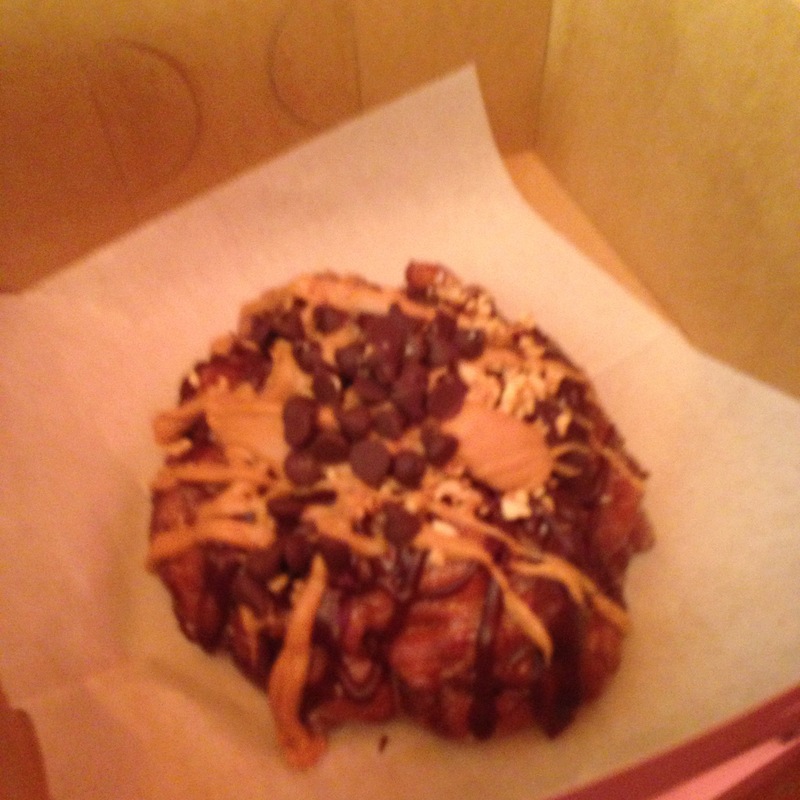 Their Memphis Mafia is a gluttonous monstrosity of a pastry: an enormous, glazed cinnamon and banana fritter topped with peanut butter, chocolate icing, and chocolate chips. It is $6 and took three of us three days to eat it. It pays loving homage to The King himself, Elvis Presley. And it is absolutely delicious. Back home, I couldn’t help but think about that combination of flavors and how great it would be as an ice cream. So here you have it. A deconstructed Memphis Mafia fritter, with a bizarrely synchronous combination of banana, peanut butter, chocolate, and cinnamon. 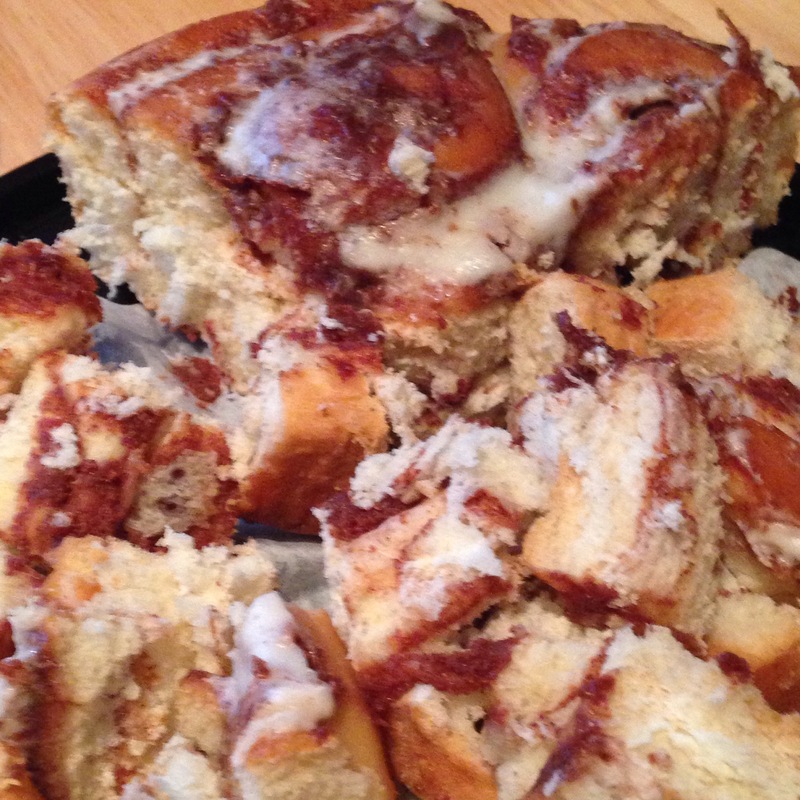 Rather than wasting several perfectly good bakery fritters, I used readily available cinnamon rolls. Their doughy, subtly sweet flavor helps keep the ice cream from becoming cloyingly sweet. Tip: dip the cinnamon rolls in the chilled custard base and set aside on wax paper just before beginning the churning process. While the custard churns, the cinnamon rolls will soak up some of the liquid, which will help prevent ice crystals from forming (and the pieces of pastry from becoming icy and brittle) during storage in the freezer. A homemade, bittersweet chocolate witha hint of sea salt ganache adds an element of sophistication. The end result is nothing short of amazing. Good luck eating more than a scoop at a time – it is so rich and filling that a little goes a long way. Kind of like the Memphis Mafia fritter itself…! *When choosing chocolate, go with good quality chocolate, but don’t worry too much about percentage chocolate/sweetness. You can use chocolate chips or junks but make sure to use only pure chocolate – no fillers or vegetable fats! I use what I have on hand. In this case, I combined 2 oz. 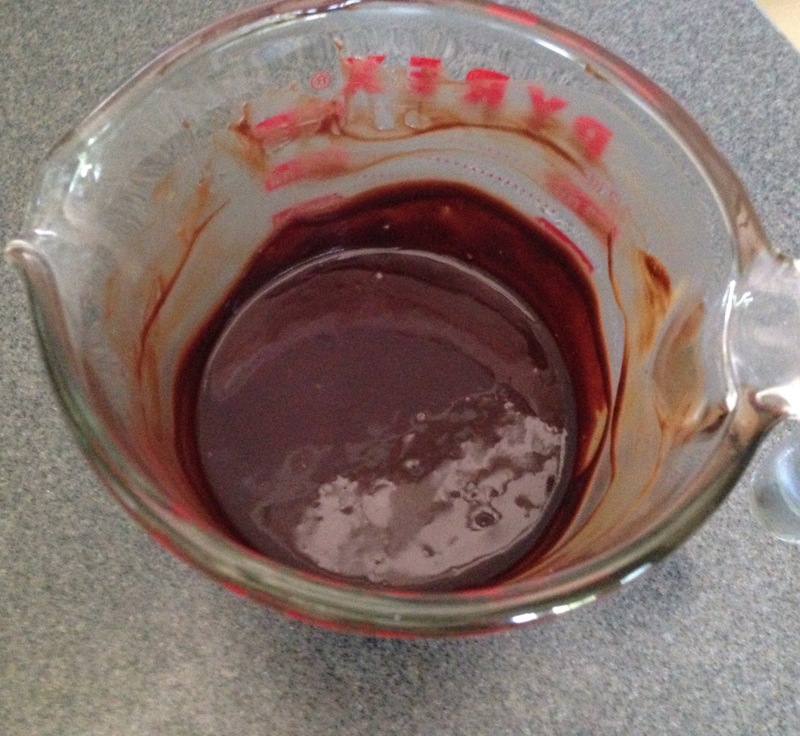 unsweetened baking chocolate (Guittard brand) with 2 oz. semisweet chunks. The result needed a bit added sugar, so you can add in 1-2 Tablespoons of granulated sugar with the heated milk to sweeten. Make the ganache at least two hours before starting the custard. It keeps well at room temperature overnight and can be made well in advance. Chop chocolate using a serrated knife. Set aside. In a microwave-safe glass container or liquid measuring cup, measure the cream. Microwave on high heat for one minute or until the cream begins to bubble. Add the chocolate to the cream and whisk to melt the chocolate. Add the salt and any additional sugar and/or vanilla if desired and whisk until smooth. Let stand uncovered until the mixture reaches room temperature and the ganache becomes somewhat firm. Cover and store at room temperature until needed per below. Chill about 20-30 minutes immediately prior to incorporating into the ice cream mixer. Leftover ganache is great on anything or makes a lovely truffle on its own. Purée the bananas in a food processor or blender; set aside. In a medium saucepan over medium heat, bring the milk and cream to a boil; if using a whole vanilla bean, steep it in the milk while heating. While the milk heats, in a small mixing bowl, beat the egg yolks with 1/4 cup brown sugar using a wire whisk (about one minute by hand). When the cream begins to bubble, remove from heat. Remove vanilla bean from the milk; slice in half vertically from top to bottom; scrape the seeds from the pod halves and add them back to the milk. Discard pods or save them for reuse. Whisk in remaining 1/2 cup sugar, cinnamon, and vanilla extract (if not using the bean) until incorporated. Temper the egg mixture: Add about 1/2 cup of the milk mixture to the small bowl with the eggs. Whisk quickly to combine. Add another 1/2 cup of the milk to the egg mixture, whisk. 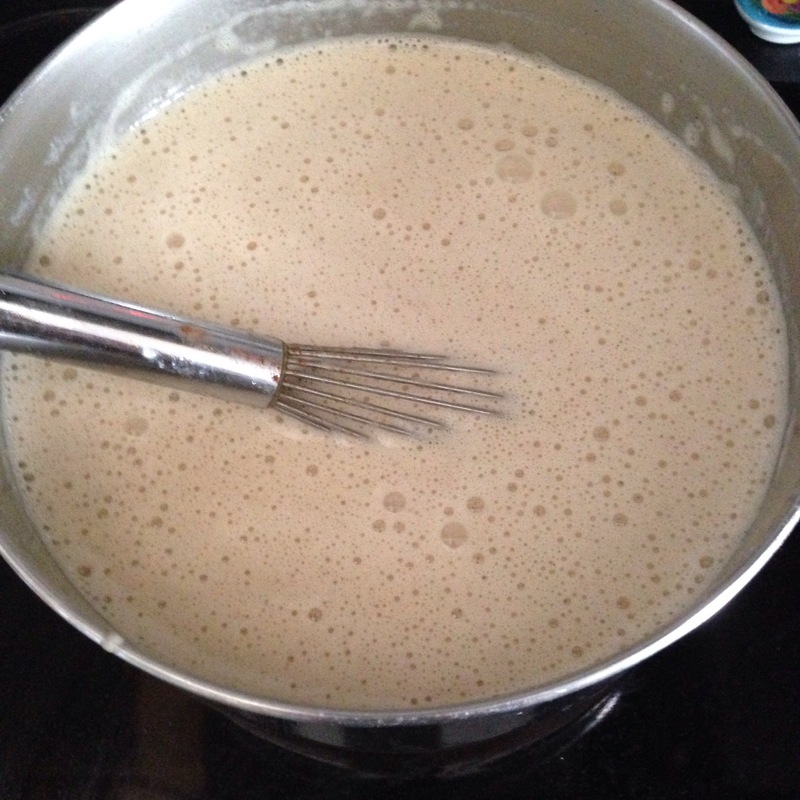 Pour the entire egg mixture into the saucepan with the remaining milk mixture and whisk thoroughly. Return back to heat and reduce heat to medium-low heat. Gradually whisk in the banana and then peanut butter until smooth. Allow the entire mixture to heat until small bubbles form. Remove immediately from heat, whisk, and cool to room temperature. Chill the custard for two hours or overnight; if time is short, chill in the freezer for 30-45 minutes, stirring occasionally. 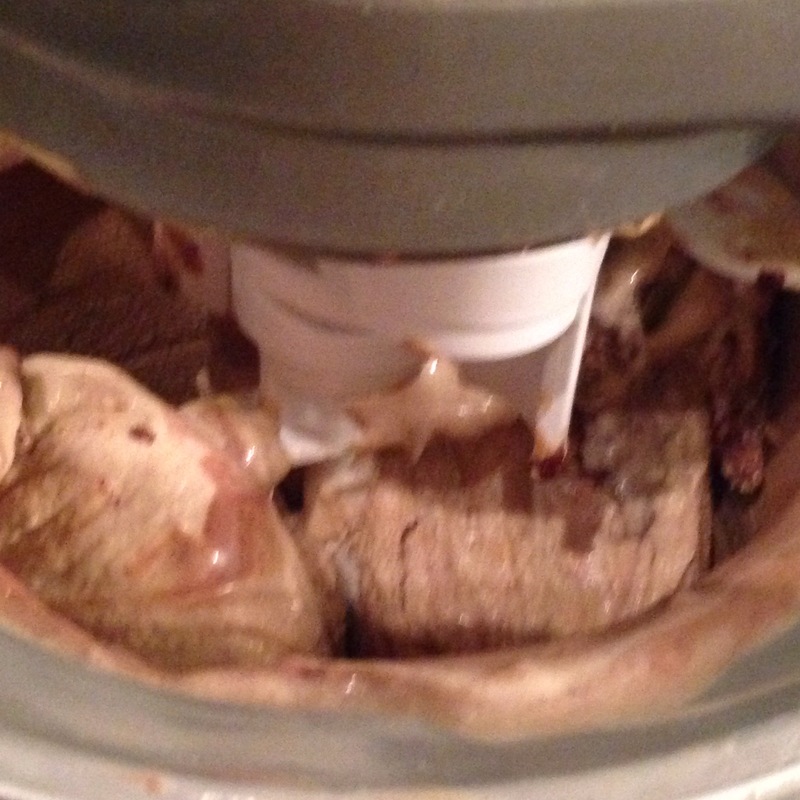 When ready to churn the ice cream, prepare your ice cream maker/attachment. Dip the cinnamon pieces in the custard individually or pour a small amount of the custard onto the cinnamon roll pieces and toss to coat. Set cinnamon roll pieces aside on wax paper and allow the custard to soak in. Pour the custard into the ice cream maker and freeze according to the equipment manufacturers’ instructions. When the ice cream is finished freezing, add the ganache and cinnamon roll pieces and allow the ice cream maker to continue to churn and mix in the ganache and pastry bits. Remove the bowl from the attachment and if needed, mix by hand with a rubber spatula to disperse the mix-ins. Serve immediately or chill for 1 hour prior to serving. Garnish with chocolate chunks. If storing long-term, freeze in small, airtight portions. Thaw for 30 minutes before serving.